Big day today, after the long weekend holiday in the US we should see if there is real interest in attacking these lows in the Dow (and the others). I hour charts and all 4 mid way in a bull flag, prior bars suggesting a retest of the flag highs but waiting for the open to confirm direction. 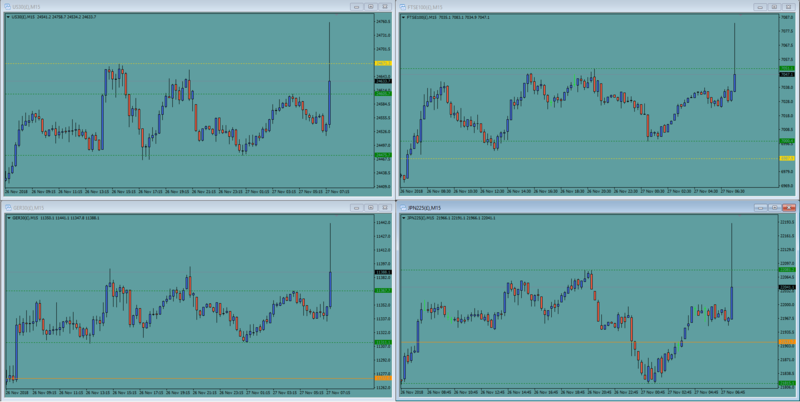 This news/non-news spike-retrace shows what the markets want to do. Spike on news Xi and Trump working on a deal reported in China, retrace when realised the report was based on phone call between the two a month ago. 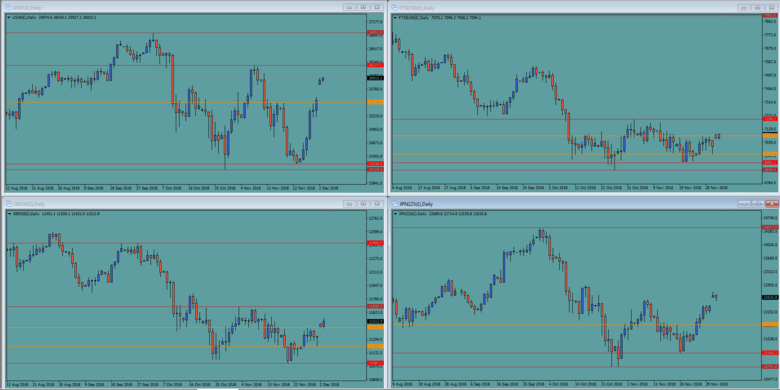 Good article here by IG's Joshua Mahony on indices and strategies from last week if you missed it. Compares indices to other markets and points out that indices are a good market to choose for those looking to buy and hold. In addition to the reasons he gives another is that indices themselves do not buy and hold, they discard the weak and adopt the strong. 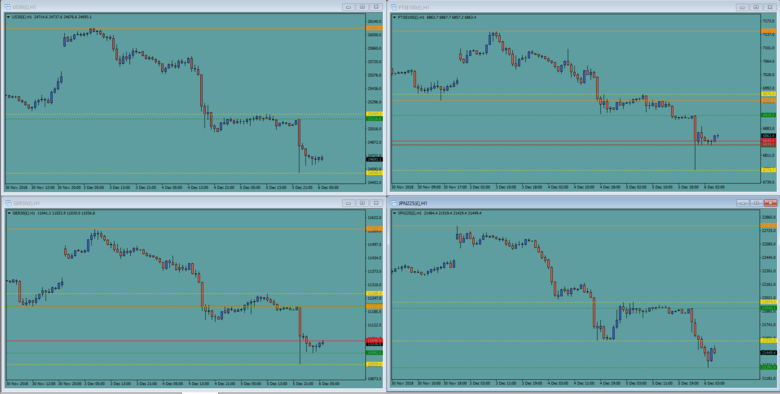 Looks at bull trends, consolidations and deep retracements. Dow climbs above prior support turned resistance at 24758 with a clear path ahead, Nikkei following while Dax and Ftse still have their own short term resistance levels to beat. US q/q GDP figures today 3.6% expected, 3.5% previous. Dow continued upward yesterday with Dax following after a shaky start, both now slowing as they close in on the resistance level taken from the daily chart (orange). Will be interesting to see if Dow attempts this hurdle, the others will be watching closely. Draghi speaks at 8 am and last FOMC meeting minutes release at 7 pm today. Caseynotes. I just came across this Forum and looked at your resistance posts earlier. I was pretty long The Dow and SPX and read your potential resistance at 25510. Just to say thanks for the work as i dumped the position this evening as we spiked on that test. It looks like you called that very well. Thank you @Stewart, am pleased my posts have been of some assistance. The key as a retail trader is to join the ride between levels but to avoid the battle at levels, so identifying those potential battle zones is of paramount importance. 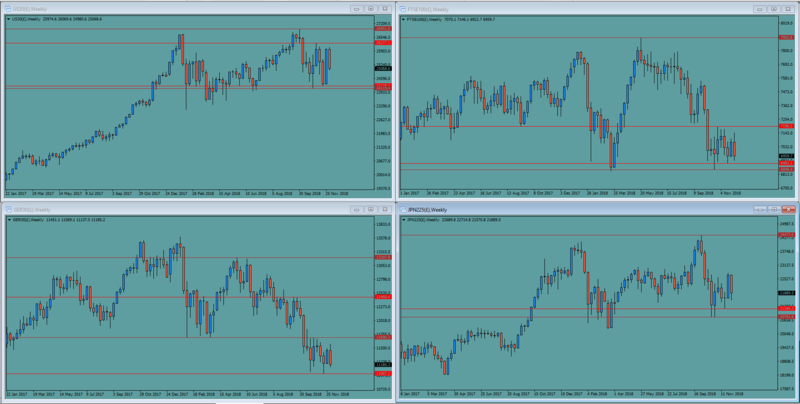 Coming into week and month end and Dow establishing a range on the 1 hour with Dax and Nikkei following suit. Ftse remains at the mercy of Brexit headlines. Waiting for European and London open for a guide as to whether the next move will be a test of range top or range bottom. Hi. I also read all these posts and wanted to say thank you but I never get involved in the convo. Its very much appreciated. Thanks Phil, there's no reason why you shouldn't add your thoughts though, all view points are interesting and all equally at the mercy of future events. Worth keeping in mind the G20 meeting starting today and continuing over the weekend. Xi and Trump will be talking and twitter is wondering about the possibilities of an announcement on trade before markets re-open. Something to consider for any positions held over the weekend. Dow retested the prior low this morning, now looking for resistance. 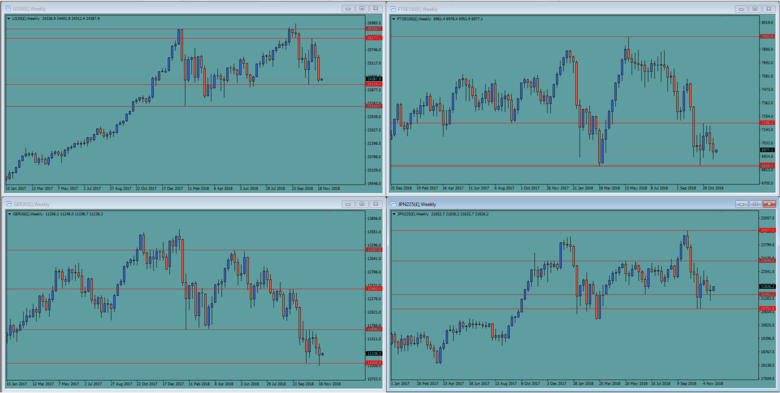 Just looking at the Weekend Dow price compared to the week close on Friday, Dow up around 260 points while Dax up around 100 points and Ftse up around 40 following the G20 summit. Following the G20 summit gaps expected in indices and FX on open, these may well be gaps not expected to be closed early on. Talk on twitter of 'the beginning of the end' of the US/China trade war. When traders walk in this morning they can see a truce on the Trade issue and oil spiking higher, yet Indices have only moved 2%. Cash balances are high so this looks likely to test previous highs into year end now IMO. It doesn't have to go up in a straight line but valuations are not stretched and the year end affect is bolstered by this double news. Dow, Dax and Ftse look to be heading onward to retest the November prior highs while Nikkei attempts to break clear beyond the prior high. Firstly thank you to all you regular contributors, as someone relatively new to trading, its great to see some experienced points of view and the logic behind it. Do you think we will a close of the various gaps before we see the much fabled santa rally possibly driving things higher? and could this rally lead to new all time highs do you think? My thoughts are if this DJI rally stays below the 76.4% at 26,284 (high 26,951 3-10-18, low 24,120 29-10-2018) (sorry I am not sure how to add charts to a post yet), then the down trend is in play still, however if this level is broken then a new all time high could be fair game. For info I have on position either way . Mercury . There's no doubt at some stage over the next 18-24 months there will be a big bear correction to core stock markets but I really doubt it happens in the run up to January. Global trade news is on hold so we are back to positioning (too much cash around) and seasonals which should lead to a good run up from these levels . Asset Managers are showing next to nil returns for their performance YTD so they all have an incentive to drive markets higher so they look better. Hedge Funds will jump on that also. This is such a great thread, on what I think is one of the most interesting moves I have seen in my short time trading. Thank you to everyone for your excellent analysis. Mercury I love your post "the big one", very very informative!! Worth a recheck of the weekly charts to put yesterday's drop into perspective. Dax continues to struggle, on top of the smoldering Italian banks story comes the ongoing 'too big to fail' Deutsche Bank drama with several raids on their head office over the last few days over corruption scandals too numerous to mention. 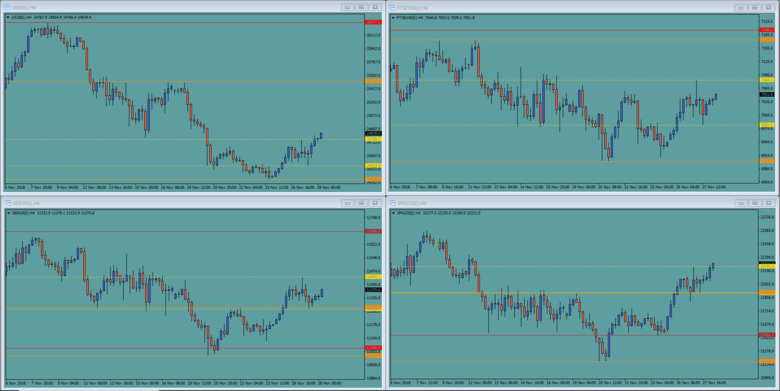 On the Dax chart looking for a break above 11207 or a retest of 11137.
what goes up, comes down !!! Ya didn't see that one coming did ya. Canada Has Arrested Huawei’s Global Chief Financial Officer In Vancouver. China embassy in Canada demands immediate release of Huawei CFO. Canada has arrested the chief financial officer of China’s Huawei Technologies, who now faces extradition to the United States on suspicion she violated U.S. trade sanctions against Iran.